There are very few books which impact readers’ understanding in a life changing way and there are even fewer characters, who remain etched in memory, long after the book is closed. However, Devdas by Sarat Chandra is one such rare novel, where the protagonist is immortalized to such an extent, that even though I knew nothing about the novelist Sharat Chandra Chattopadhyay, I was very well aware of the name Devdas, even in my school days. He was an epithet for a jilted lover, who is crying hoarse over his beloved’s betrayal. I think, it is not just me, almost every teenager is familiar with this iconic name, though clueless about his origin. However, as I grew up and showed a genuine interest in novels, I came to know of Sarat Chandra’s famous novel, Devdas, which has spurned the imagination of many film makers. Though, I did try to read a few stories by Sarat Chandra, I had not made any sincere effort to read his works, till I watched Shahrukh starrer Devdas, and was floored by the anti-hero concept. 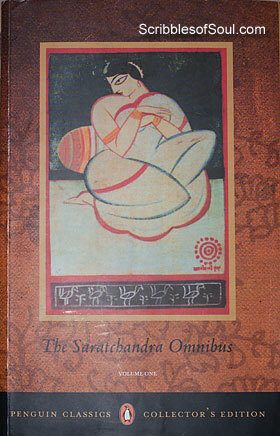 As I laid hands recently on Saratchandra Omnibus, my first instinct was to skip initial few pages and jump to Devdas. Though, thankfully, I persisted in reading the first novel, Srikanta, and was amply rewarded for my patience. And, I think, it will be a long time, before I can forget Srikanta. But, let me come back to the present review about Devdas, a novel that has old classic feel and is yet modern enough to allow readers to relate to its characters in an easy manner. Devdas Mukherjee and Parvati aka Paro of Talshonapur are the protagonists of the novel, amply supported by Chandramukhi, a dancing girl. As I said above, I had already seen the movie, before I delved into this novel, so a comparison between the two is inevitable. I found the basic characters of Devdas, Parvati and Chandramukhi same as in the movie, though unglamorous in comparison to Bhansali’s Devdas, but for the same reason they appeared much more life like and humane. I was quiet surprised when the novel began with the childhood of two kids, showing Devdas as a naughty, arrogant boy, who takes Paro for granted. He hits her, and yet expects her to do his chores, just like any old sibling will do. Strangely, it is only Paro, who is initially harboring love pangs, whereas Deva, growing up in Urban Calcutta, had almost forgotten her. But as is the human nature, the moment, Paro becomes unattainable, Devdas pines for her love and wastes away his life in drinking. I loved the younger Deva, who appeared carefree, somewhat haughty, yet adorable. Particularly, the episode, where Paro gives away his money to Boshtomis, and he good heartedly supports her decision, I simply liked him. Had he remained as crazy and as frank, as he was in childhood, I seriously feel I would have fallen in love with him, as did Paro. But, as he grew up, he lost his appeal. He increasingly appeared as a weak willed individual, who allowed one untoward incident to ruin his entire life. Destiny does give him a chance to make his life worthy, but he just continues to sink deeper, and thus lost my sympathy. His attitude towards Chandramukhi smacked of his arrogance, and this time, it had no genuine concern to mitigate the bitterness. Though, Sarat does try to salvage his main character in the end, by presenting his tragic death in the most sensitive way, I just could not forgive Devdas for his utter foolhardiness. Unlike Srikanta, he learns nothing from his experience, and though the novel is called by his name, it is only the heroines of the novel who shine through. Paro and Chandramukhi both come across as bold women, who are capable of taking their own decision and of facing consequences, with an open heart. A strong woman is a constant feature in Sharat’s novels, and in the present novel, there are two of them, and I just loved having a sneak peek into their thoughts. Paro floored me with her innocence in childhood, her pure love for Devda, though she is unsure of her true feelings, she adores him. As she grew up, her confidence builds up too, and she herself proposes marriage to Devdas, a very bold move for any girl, even today. When her love is rejected, she holds her head high and plunges into her new role as a dutiful wife and an affectionate mother with gusto. It is only in the very end that she loses control, but again, it highlighted the depth of her affection. I found Chandramukhi quite similar to Pyari of Shrikanta, who has tasted much bitterness in life and is yet able to transform herself into a benign woman by just one touch. She deserves accolades for her pure heart and genuine affection for a hard hearted man. Last, but not the least, Sreejata Guha did a fantastic job. Without her meticulous translation, Devdas could never appear so entertaining. I had loved her translation of Chokher Bali, and the love continues with Devdas. In short, I loved the novel much more than the movie. Devdas is a great story with ample possibilities of expansion and perhaps an eternal favorite of movie makers. An absolute must read. I think Sarat Chandra was unnecessarily cruel to Devdas. He deserved to die painfully, but the way his last days were dragged on, separating him from his servant, the car driver refusing to carry him, the cow-drawn carriage taking days, prolonging his suffering bit by bit, to be left at the gate unattended without medical attendance, refusal of the local people to offer him last rites, and finally his body to be discarded even by the low class people, the “domes”, to be eaten by foxes and vultures – it appeared to me Sarat Chandra was vindictive to him. I think what the author is trying to speak is much deeper than the words. It’s not devdas’s will that makes him what he becomes but Paro’s vow. He’s pulled in and therefore, he’s alone and miserable.